Is This the Right Time to Sell My Home in Denver, CO? This beautiful Tallyn’s Reach home shows like a model! Looking for a stunning kitchen? The large eat-in kitchen will definitely impress all home chefs with high-quality features, such as silestone counters with tile backsplash, stainless steel appliances including a double oven, plentiful 42-inch maple cabinets, 5-burner gas range, built-in desk area, and a large island. The focal point of the adjacent family room is a charming fireplace with stone surround. You will also find a formal dining room and a roomy office featuring an entire wall of built-in shelving. Upstairs, the large master suite is highlighted by a coved ceiling, as well as a beautiful five-piece bath with jetted oval tub and a huge walk-in closet. You will also find a spacious, versatile loft, along with two secondary bedrooms sharing a large bathroom with double sinks and lovely tile. Another notable feature of this home is the amazing finished basement featuring a spectacular wet bar with granite counters and Thomasville alder cabinetry. There is also a second family room, space for a workout room and/or game room, plus a fourth bedroom and luxurious three-quarter bathroom. If you enjoy outdoor Colorado living, you will love relaxing on the large, covered patio. There is plenty of storage for your cars and toys in the split, oversized three-car garage. 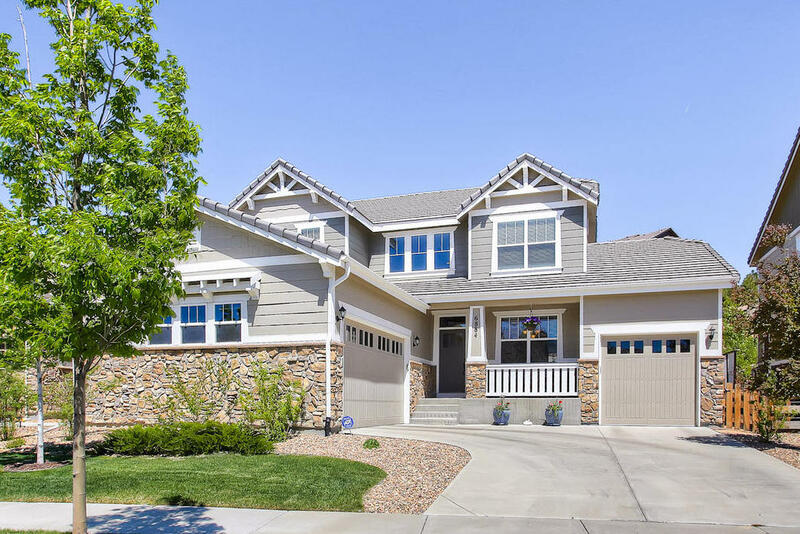 This home is located in the Cherry Creek School District and offers easy access to E-470, DIA and the Denver Tech Center. Southlands Mall, with numerous shopping and dining choices, is just minutes away. For more information or to schedule a showing, please contact Wendy at (303) 808-0239, or Contact us via email. This entry was posted on Tuesday, May 8th, 2012 at 1:54 pm	and is filed under Denver Homes for Sale. You can follow any responses to this entry through the RSS 2.0 feed. You can leave a response, or trackback from your own site.